Standard pushpit mount. Suitable for all VHF or GPS antennas. puce1} A Plasticlip, to be adapted on any tube Ø 18.5 to 25.5 mm. 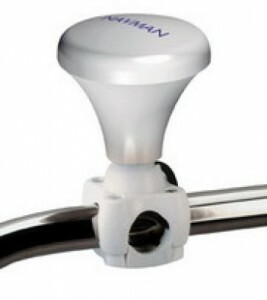 • An antenna base Ø 1", 14 tpi thread (turn per inch). Features a lateral outlet for cable. Can be used on its own to mount the antenna on a flat surface. Supplied with mounting screws.